Should Handguns be Prohibited in Canada? The Federal Government has opened a website to survey Canadians’ views on this issue. we should not lose sight of the reason for the survey: to determine if Canadians are willing to ban handguns. of the Alberta Handgun Association. Read what the Minister has written and please provide constructive feedback. We only ask that you give your input and encourage others to give input … as the Minister has requested. at the 12th Championship of the Americas, in Guadalajara, Mexico. and the 2020 Olympic Games! has won Canada an Olympic Games Quota spot. Join a shooting sport community that is passionate and determined. Whether you’re here for recreation or committed to high performance goals, the Alberta Handgun Association delivers the program you need. The Alberta government, through the Alberta Federation of Shooting Sports, offer a number of annual grants to member athletes of the Alberta Handgun Association. Visit the Grants section for more information. We offer events throughout the season, officiated by ISSF accredited A & B level judges and shot entirely using Megalink Electronic Scoring Targets. Our competitions are open to all genders and ages. 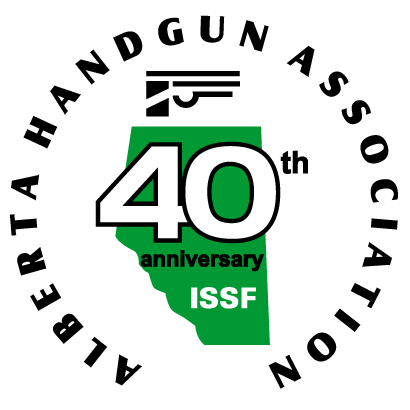 Annual ISSF 25m & 50m Pistol events to determine the Alberta Provincial Champions. Annual indoor ISSF 10m Air Pistol and Air Rifle event hosted by the Calgary Rifle & Pistol Club in association with the AHA. This classic open match includes both individual and mixed team competition. Annual indoor ISSF 10m Air Pistol event. The Alberta Handgun Association invites both air pistol and air rifle athletes to compete in this individual and mixed gender team match. Shot on Megalink Electronic Scoring Targets, both men and women, juniors and seniors compete to determine the provincial champion. Included in this match is the ISSF Mixed Gender Team Event. Annual indoor ISSF 10m Air Gun event. Hosted by the Calgary Rifle & Pistol Club in association with the AHA, this single day event is open to both Air Pistol and Air Rifle competitors.